Whitetail Mountain Lodge is situated in beautiful Lycoming County, PA, with over 1,200 acres of mountains terrain. We offer novice to seasoned hunters an experience of a lifetime. 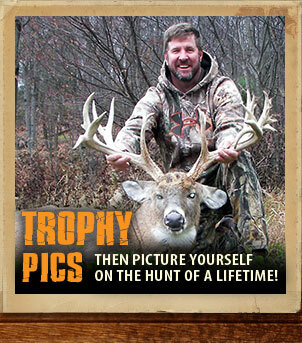 Whitetail Mountain Lodge has an outstanding variety of typical and non-typical buck, with your option of using rifle, muzzle-loader or archery. New to Whitetail Mountain Lodge is the opportunity for long range hunting on many of our food plots. We are Pennsylvania's premiere whitetail deer hunting destination. ©2019 Whitetail Mountain Lodge. All Rights Reserved.